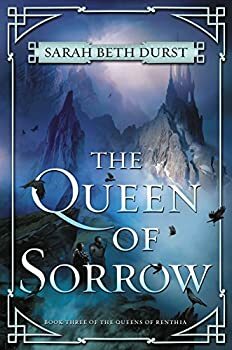 The Queen of Sorrow (2018) is the third volume in Sarah Beth Durst’s THE QUEENS OF RENTHIA series, appearing to conclude the storylines of Queens Daleina, Naelin, and Merecot which began in The Queen of Blood and were explored further The Reluctant Queen. Renthia is a world filled with all manner of spirits, who are capable of tremendous destruction unless kept under tight control by the queen of the realm, who must also perform the expected state duties of caring for her subjects and guarding against incursion from foreign entities. It’s a lot of responsibility, and the strength of a queen is measured by her ability to balance those duties and keep the rebellious natural world in check. Queen Daleina shares her responsibilities with Queen Naelin, watching over the people of Aratay and using the combined force of their magical abilities to lever an impressive amount of control and coercion over the air, forest, and fire spirits. That control and security is destroyed in mere moments, however, when Naelin’s two children are kidnapped and taken to the neighboring country of Semo — Naelin’s overwhelming terror and rage drives the spirits into a frenzy, instantaneously ruining crops and felling trees, and it’s all Daleina can do to limit the damage and protect their people from massive famine. Meanwhile, in Semo, Aratay-born Queen Merecot is both impressively ambitious and powerful; abducting Naelin’s children is only a small part of her grander plan for all of Renthia, a plan she’s been formulating and nurturing for years under the guidance of Semo’s former queen, Jastra. As Durst slowly unfolds Merecot’s ultimate vision and the motivations behind extreme tactics like abducting children or her previous invasion of Aratay, Merecot becomes much more than a stock villain steepling her fingers and cackling amid lightning and thunder. She’s ambitious and dangerous, yes, but eventually sympathetic, and it’s easy to see how things might have gone differently had she been a little more patient or received better guidance. In fact, it’s those missed opportunities and diverse perspectives that make The Queen of Sorrow so compelling: Durst’s three primary queens approach problems and conflicts with entirely different mindsets, and yet their choices all stem from the shared desire to be good stewards of their lands and peoples. It’s the effects of those choices that determine whether they’re viewed as good queens, and Durst makes the point again and again that cooperation and understanding are the key to their success. As in The Reluctant Queen, the varying levels of life experience and skill possessed by the main characters enrich The Queen of Sorrow, and each of them brings an essential component to the story. Daleina is still young, for all that she’s been through, and her younger sister Arin brings a joyfully impetuous spark to every one of her scenes, while Naelin’s fierce maternal instinct and protective nature drive her to take greater and greater risks in order to ensure the safety of her children first and Aratay second. Merecot’s blazing confidence and determination hide her desperation and fear from nearly everyone but Headmistress-turned-Ambassador Hanna, sent from Aratay’s academy to negotiate for the safe retrieval of Naelin’s children. The “Queen of Sorrow” title initially refers to Naelin, but could easily refer to any of the queens at various points. Heavy is the head that wears the crown, after all. The brief glimpses of the lands beyond Aratay — Belene and Chell and Elhim, each ruled by queens and bordered by untamed lands filled with feral spirits, and facing their own struggles — only whetted my appetite for more stories and adventures. Fans will be pleased to learn that Durst, according to The Queen of Sorrow’s acknowledgements, has another Renthia novel in store. Personally, I will gladly read any and all books she chooses to write about this wonderful, imaginative world. Highly recommended. Publication date: May 15, 2018. 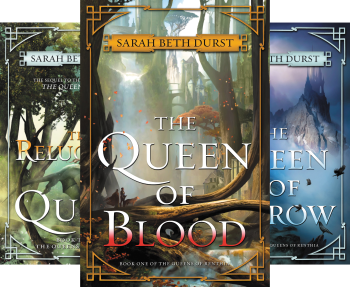 The battle between vicious spirits and strong-willed queens that started in the award-winning The Queen of Blood and continued in the powerful The Reluctant Queen comes to a stunning conclusion in The Queen of Sorrow, the final volume of Sarah Beth Durst’s Queens of Renthia trilogy. Queen Daleina has yearned to bring peace and prosperity to her beloved forest home—a hope that seemed doomed when neighboring forces invaded Aratay. Now, with the powerful Queen Naelin ruling by her side, Daleina believes that her dream of ushering in a new era can be realized, even in a land plagued by malevolent nature spirits who thirst for the end of human life. And then Naelin’s children are kidnapped by spirits. Nothing is more important to her than her family, and Naelin would rather watch the world burn than see her children harmed. Blaming the defeated Queen Merecot of Semo for the kidnapping, Naelin is ready to start a war—and has the power to do it. But Merecot has grander plans than a bloody battle with her southern neighbors. Taking the children is merely one step in a plot to change the future of all Renthia, either by ending the threat of spirits once and for all . . . or plunging the world into chaos. I have this book but haven’t managed to get to it yet. You’re prompting me to push it up to the top of the TBR list! Yes, I can’t wait to read this one and I hope Harmon’s brilliant, amoral mother makes an appearance in it. Jana, are the books in this series good as “stand-alones” as well? I wouldn’t recommend it — they build on each other, so it’s best to start at the beginning. That would take me a while!! But I guarantee that they’re worth every minute!